This lamp is great! It is very gold in color and shiny with an aged patina. The lampshade is white with a fine woven texture. Easy to put together and sturdy. I have it in my bedroom corner for reading and it provides enough light for this purpose. It comes with one LED bulb. 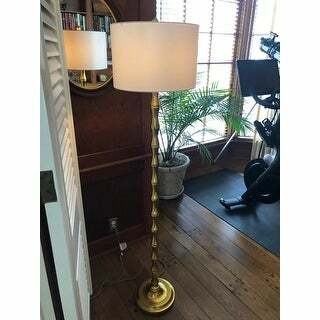 Showcase your sophisticated decorating style by displaying this antique gold floor lamp with a white cotton shade. 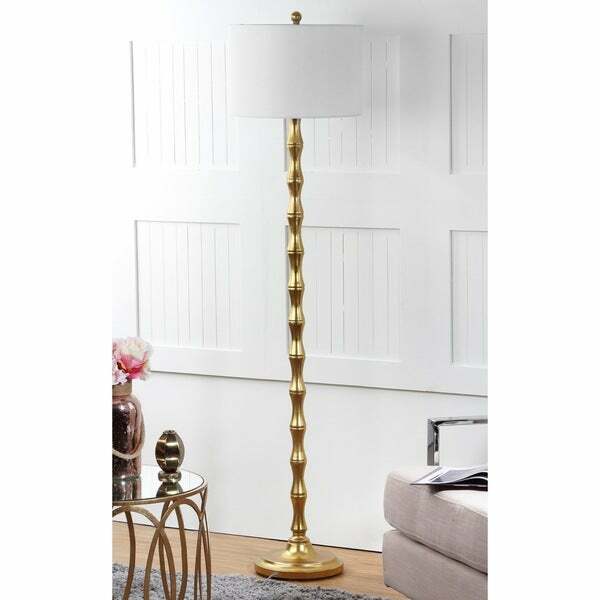 This floor lamp features a rotary switch and gentle curves at the base for an elegant look in your home or office. I was apprehensive about purchasing this lamp but after reading the reviews I decided I would buy it. 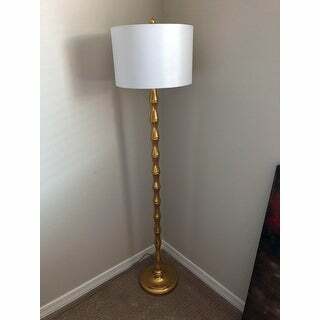 It's a very stunning floor lamp that would go with a lot of different home decors. Unfortunately, for some reason I received it with small flaws/defects and what even appeared to be a return that was repackaged. I rated it a 4 for that reason only because it I had to return it. Customer service did apologize and ask if I would like to have another one sent to me but I was completely turned off about it. I definitely would recommend it. Just beware of the fact that there are items that are returned, repackaged and sent to an unsuspecting customer. 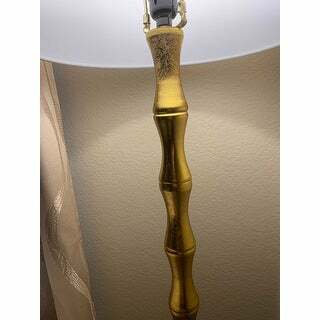 Safavieh Lighting 63.5-inch Aurelia Antiqued Gold Floor Lamp is a must get! The installation is sooooo easy, maybe 5 minutes and the lampshade looks amazing! 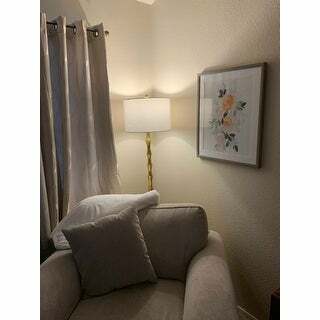 I saw this lamp in a model home as part of the decor and fell in love with it. I finally tracked it down here on O. It is exactly as pictured! The gold is a deep gold, but does appear more yellowish when lit. The quality is great. The lamp shade is a true white, not off-white. I would recommend. I am really happy with this lamp. I bought it for my library and it looks great. The gold base looks a bit aged like a patina and the shade is nice quality. It even has a cloth cord like lamps used to have. I like that it’s tall enough you can’t look down into the shade and see the bulb. Overall a great floor lamp. Gold is very bright. Very much like a gold leaf. Others have said the shade isn’t nice but I think it’s nice. Not super fancy but not the cheap paper kind either. Assembly was easy. Bonus that it came with an LED bulb! 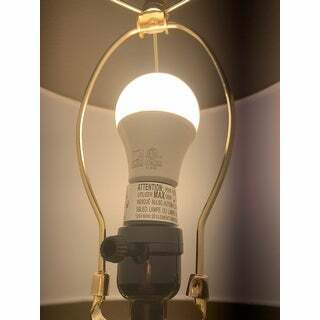 The lamp was packaged effectively as to not have to worry about damage during shipping and was easy to put together. I would jabe liked a different shade as you can see some of the hardware through the shade but that is minor. It looks like a much more expensive lamp than what I paid for it. I absolutely Love this Safavieh 63.5" Lamp. It really sets off the rug that I also purchased from Safavieh. Perfect height and it looks so expensive and mature. My finance also likes it which says a lot as our taste definitely varies. I wanted a lamp higher than the standard lamp and this one definitely does the trick. It also came with the light bulb which I really appreciated. Keep up the great work and products. This lamp feels very high-quality, and I love that it shipped with the shade and bulb. It is perfect in my space. I wish the gold were a little more antiqued (it's pretty bright), but I would definitely buy it again. It's a great floor lamp! Except for one tiny little thing: cheap lampshade. The kind of cheap where when you handle it roughly you might leave a crease in the shade that will not flatten out. I switched out the shade it the lamp looks expensive. As a fan of the faux bamboo look, it works. Easy assembly and looks like it picture. Was a great addition to the room. I love this lamp! Came packaged very well in a manageable sized box. Went together in a snap. At first, I wasn't sure I was crazy about how bright the gold is...I was expecting a more muted tone. However, I went ahead, assembled it, and when I turned the switch...it was perfect! This lamp went perfect with my living room set. I decided to mix and match my items. And it came out looking bomb. I like that it’s different from the table lamp. Gives it a little more character. Just as pictured! It's deep gold color, brass. Not heavy, at first it looked cheap when I opened the box but once i put it together and put it up in the living room. Looks nice! I bought this as a present for my daughter. She loves it. It looks great with the other pieces in her sitting room. "Does the rotary switch imply that this lamp is dimmable?" This simply means the switch changes by rotation. The estimated assembly time is 6 minutes. "I'm having an issue tightening the base. When I try to tighten it, it just spins. Am I supposed to do something to tighten it?" Is there anyone out there? How do you tighten the base? All it does it spin. I can't be the only one who's had this problem. Thank you. "forgot to ask, what is the diameter (thickness) of the vertical pole? Thanks in advance." "what is the height of the shade? 15" wide x ? high/"
The lamp weighs 10 pounds.